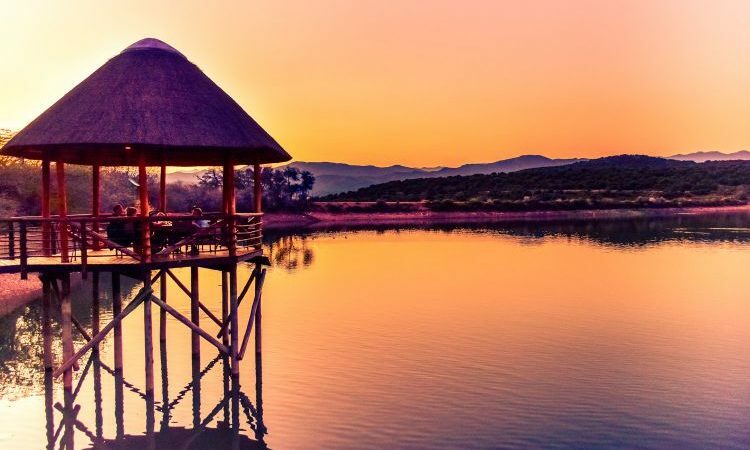 Situated just outside Oudtshoorn and en-route to the Cango Caves, four star Buffelsdrift Game Lodge offers its guests luxury tented accommodation with sprawling views and a variety of wildlife. We are proud to offer our guests unique opportunities to interact with our animals, the most popular being our elephant interactions, as well as a fantastic on-site restaurant and a spa overlooking the dam. Buffelsdrift Game Lodge offers 9 Luxury Waterfront tents (situated on the water’s edge), 16 Luxury tents and 4 Luxury Family tents. Each tent has its own en-suite bathroom and private outdoor shower, air-conditioning, mini-bar, digital safe, tea/coffee facilities and a game viewing deck. Each of the 29 free-standing luxury tents offers beautiful views over the waterhole and to the Swartberg Mountains. Simply and stylishly decorated, Buffelsdrift not only offers guests a true bushveld experience, but the real comforts of luxury accommodation. Buffelsdrift also has 24hr on-site service, with friendly staff to cater for your every need. Our lodge is well-known for the many activities we offer that give our guests the opportunity to get up close to our incredible animals, and interact with our three African elephants. To name a few, Buffelsdrift offers morning and evening bush safaris, meerkat safaris and elephant excursions such as elephant brushing, walking and feeding. Spoil yourself with a spa treatment of your choice from the variety of African massage treatments we offer at our spa after a long day of exploring. We pride ourselves in our personalized service, superb buffet and à la carte menus, excellent conference facilities and the ideal setting for that romantic wedding with a difference. “Out of Africa, with some luxury” – Exactly as one of our recent guests remarked. We truly strive to bring you the best accommodation in Oudtshoorn and the Garden Route & Klein Karoo. A true African experience, with a touch of comfort and luxury. Enjoy the privacy of one of our 34 free-standing luxury tents. Simply and stylishly decorated, they not only offer you a true bushveld experience, but real comforts of luxury accommodation. We also have 24h onsite service, with friendly staff to cater for your every need. Experience true “African” style waterfront accommodation in Oudtshoorn. Our accommodation (waterfront tents) are perfect for those who enjoy the closeness of the water’s edge. The sundeck on each waterfront tent overlaps the water’s edge and is the ideal spot to relax during your stay with us. 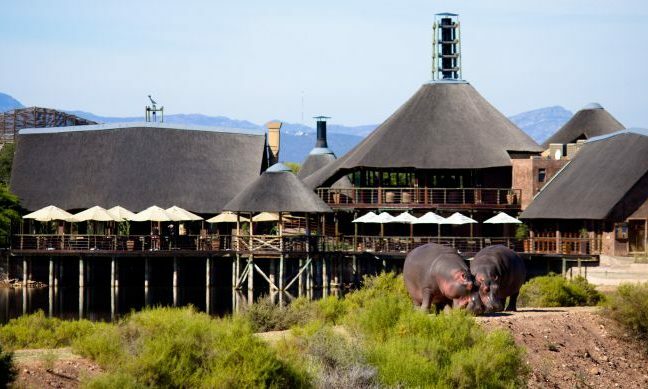 Enjoy sundowners on the deck whilst viewing our free-roaming animals in the water and surrounding banks. The luxury tents are set only a few metres away from the waterhole and provide an elevated view of the surroundings. They also have great views over the whole lodge area and is surrounded by true Karoo fynbos. The Family units have a spacious main room and a children’s room with a shared en-suite bathroom separating the rooms. These units can accommodate a family of up to 5 people. The family tents provide an elevated view of the surroundings and Swartberg Mountains and is in walking distance of the 5 hectare waterhole. True Karoo fynbos and bushveld surrounds these tents, creating an authentic bushveld experience. One might even be lucky enough to spot wildlife in the distance.